One of the best ways for young children to experience color is by painting with watercolors on wet paper. It is a process art technique where the emphasis is placed on the experience of color as opposed to the form that the painting takes. Painting sessions should not be treated as lessons, but as experiences. 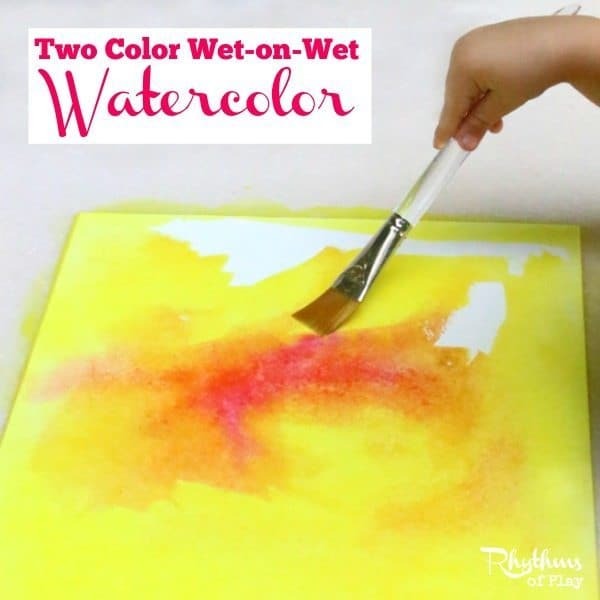 Two color wet-on-wet watercolor painting is begun after a child has tried their hand at single color wet-on-wet watercolor painting. In Waldorf education, a second color is not introduced until a child has worked extensively with single colors. To learn more about single color wet-on-wet watercolor click on the link. In Waldorf early childhood programs only the primary colors–red, yellow, and blue–are used. These will eventually allow for an infinite number of other colors to appear upon the wet watercolor paper. In the Waldorf tradition, good quality art materials are always used. It is believed that they appeal to and are better for the sensory nature of the child. a sink, tub, or tray large enough to soak the paper. A flat waterproof surface or paint board to work on. 1 to 1 1/2 flat wash watercolor brush. 8 oz canning jar for mixing and storing paints. Two natural sponges – or one cut in half. (One clean to wipe paper of excess water, and one to clean board or surface once finished.) We use the natural sponges sold at Trader Joes–love them! The first time you do wet-on-wet watercolor painting with a child will be when you work with each color individually. You will mix up enough paint to last each time you introduce a new color. The mixed paint can be stored for quite a while in a canning jar in the refrigerator. Please see Single Color Wet-on-Wet Watercolor Painting for more information. One to three children will be able to paint for several months using the original mix before you will need to make another batch of paint. While an entire classroom full of kids may need to mix up a new batch of paint each time. 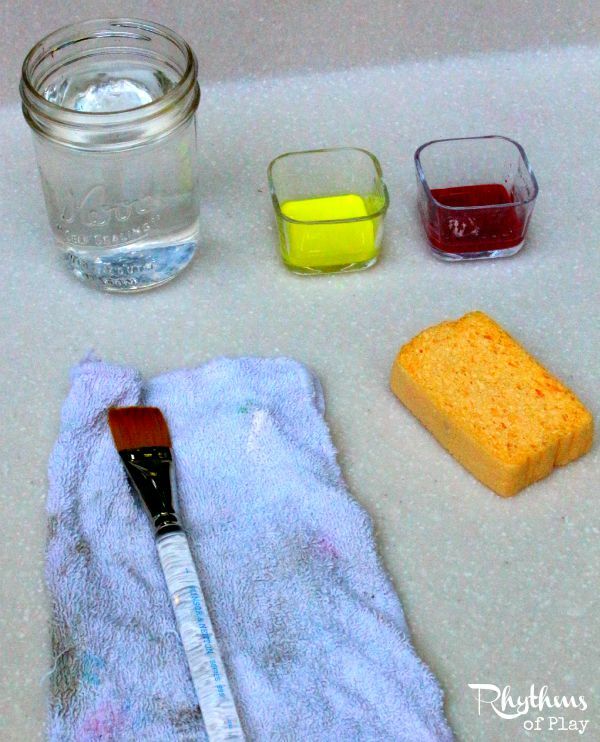 For directions on how to mix the paint, set up, and get started with wet-on-wet watercolor painting please see Single Color Wet-on-Wet Watercolor Painting. We like to work on our DIY Outdoor Art Table and Mud Kitchen. Click on the link to learn how to make one for your little artist. When working with two colors you will begin by pouring two colors (from the stored mixed paint) into separate jars. Before handing the paintbrush over to your child make sure that you demonstrate how the paintbrush needs to be rinsed before changing colors. You don’t need to provide any “lessons” other than the color story and your demonstration. (See Single Color Wet-on-Wet Watercolor Painting to learn more about this.) It may sound odd at first to teach in this way, but it is so much better for the young child’s understanding. Children are imitative creatures. They need to see you doing it to know what to do, and how to do it. When you begin to work with two colors after working with only one, a child will be delighted to discover what happens when yellow plays with red, or blue plays with yellow, or red plays with blue. Shhh… don’t tell them about it. Do your best to refrain from teaching anything. Simply allow the child to experience the colors as they appear while painting. 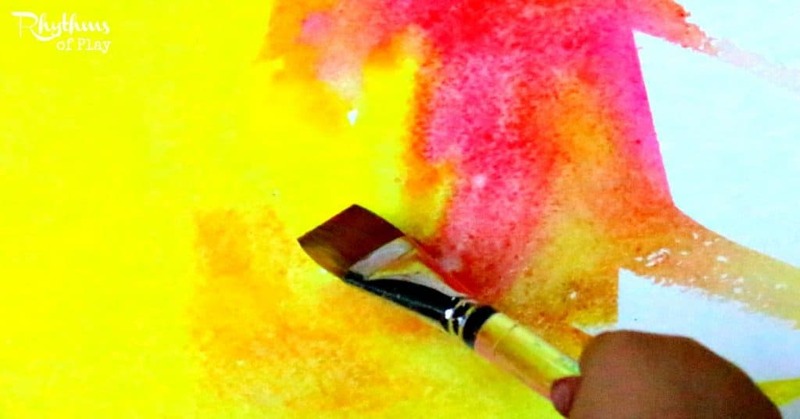 When children begin painting using watercolors in this way they will have an experience of color as opposed to an intellectual understanding of it. Learning that yellow and red make orange while painting with watercolors provides the experience of that knowledge. It is hard to forget something you have had a direct experience of. Children that learn yellow and blue make green by experiencing it, are much more likely to both remember it and understand it. Allow your child to experience what happens when yellow plays with red, or blue plays with yellow, or red plays with blue. After they have played with two colors for quite a while you can offer them all three colors at once. I will be publising Three Color Wet-on-Wet Watercolor Painting in mid-August 2016. Sign up for my newsletter below so you don’t miss it. 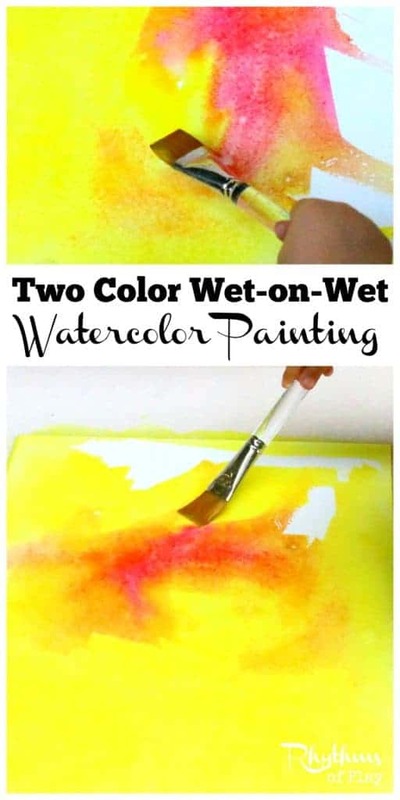 Two color wet-on-wet watercolor painting is one of the best ways for young children to experience color. It is a process art technique where the emphasis is placed on the experience of color as opposed to the form that the painting takes. Simply allow the child to experience the colors as they appear while painting. Once finished your child’s art can be made into cards and all sorts of various creations such as Watercolor and Fall Leaves Art. Sign up for our newsletter so you don’t miss more fun ways to use your child’s watercolor paintings. I have included affiliate links for your conveniece. Thank you for choosing to support this blog! For more ideas follow my Kid’s Art Pinterest board! I am no longer a fan of Waldorf, but I think some of the artistic practices such as this are beautiful and can be used in many different approaches! I wish we saw more trusting of children with real artistic mediums and techniques, like Waldorf handiwork and art classes allow. I agree, artistic practices such as these are so important for the child. They really need the opportunity to experience and create without anyone telling them that it needs to be a certain way.